Volare is nested in the little old town of Brenham, Texas. 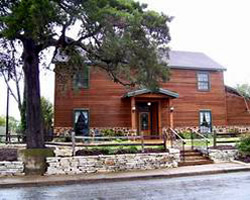 It is located two blocks east of downtown, on Ross Street, between Alamo and Main. (Parking is available across the street from the front entrance to the restaurant). This unique town is know for its numerous historical landmarks and for its welcoming of visitors from all over the world. Brenham is also know for its large fields of Blue Bonnet flowers in April, its Blue Bell ice cream factory, and its various festivals. But Brenham is becoming especially known for its great Italian cuisine that comes from the kitchen of the infamous man in the funny pajama pants, “Mr. Volare”. If you want directions from a live person don’t hesitate to call us – we will be happy to guide you to our location. And just remember, if you get lost, simply follow the aroma.